ca 480 - 440 B.C. 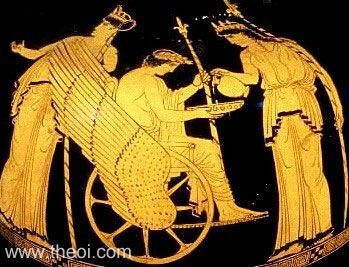 Triptolemus prepares to depart in a winged chariot to spread knowledge of agriculture. He is flanked by the goddesses Demeter and Persephone. Hecate (not shown) stands to one side. Each of the figures holds a royal, lotus-tipped sceptre. The goddesses wear crowns and the hero wears a wreath of grain(?). Demeter serves Triptolemus a beverage from a jug--presumably the sacred mint and barley drink of the Eleusinian mysteries.